Bailey is full of energy. She never stops and never ceases to amaze us with her new talents! Her latest one is pulling up. 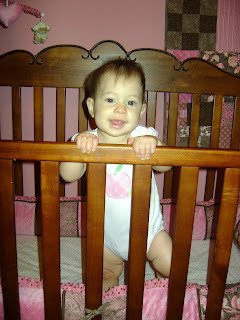 I caught her standing up in her crib for the first time the other day and ran to get the camera. She is so strong and look at those cute little thighs! She is even taking a couple of steps down the couch. Not full blown cruising yet but on the way. I really wouldn't be surprised if she walks early! For your sake I hope not. Kate was walking at 11 months - talk about energy!